A man is being held on suspicion of attempted murder after a woman was stabbed outside a primary school. 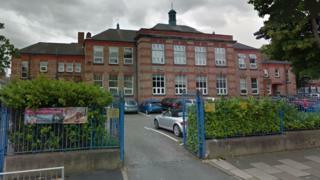 Police believe the woman in her 30s was assaulted on her way back to her car at Devonshire Park Primary School in Birkenhead, Wirral, at about 08:20 BST. She was taken to hospital with knife injuries to her hand although they are not believed to be life-threatening. A man, aged 61 and from Wirral, is being questioned. The school has been closed until further notice. North West Ambulance Service confirmed a woman has been taken to Arrowe Park Hospital.